The bleep system has a long history of use in healthcare institutions for communication between teams. However, poor bleep culture has been noted to result in delays in patient care and to negatively impact on outcomes in several different settings1, 2. Furthermore, a number of studies have suggested that the system is now outdated, and that alternatives should be used for improved communication in hospital environments3, 4. 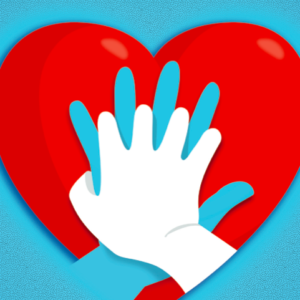 Bleeps are a key means of communication between medical, nursing and therapy teams. They are also used to make referrals between specialties, or for discussion of patients under joint care under several teams. Mountain ward is a 42-bed paediatric ward in the Evelina London Children’s Hospital, incorporating an 8-bed medical High Dependency Unit (HDU) and 4-bed surgical HDU area for children requiring high acuity care. Many patients, including those not in HDU, have complex long-term health needs and require input from multiple different specialties during their admission. The ward team cares for patients under a wide range of specialties: general paediatrics, respiratory, infectious diseases, general surgery, ENT, vascular and plastics as well as outlying patients from other paediatric specialties. The majority of patients have input from the general paediatric team. 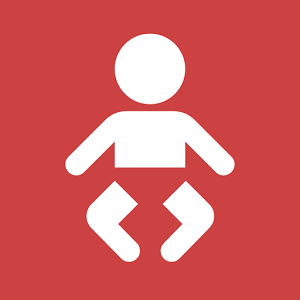 General Paediatric SHOs have responsibility for patients based on their location; with each SHO covering 1-2 ‘bays’ of the ward. However, the ward is large and the doctor’s office is far from several of these bays, meaning that nurses mainly rely on bleeps to contact the doctor allocated to their bay. Whilst working on Mountain ward, it became clear that there were several problems associated with the bleep system. This was causing frustration and had the potential to negatively impact on patient care. 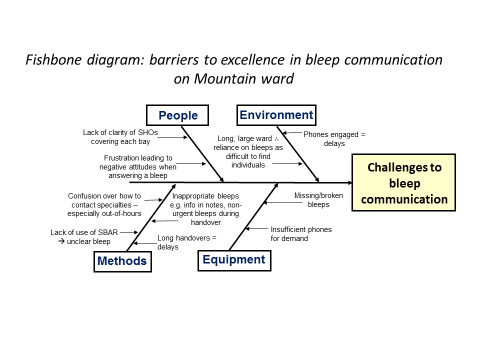 In order to understand the challenges facing bleep communication on Mountain ward, an anonymous online survey was sent to both medical and nursing staff. A total of 10 doctors and 13 nurses responded to the questionnaire (of around 300 staff on Mountain Global email address). Quantitative data was obtained on bleep response rates and the frequency of mis-directed bleeps, and qualitative data obtained regarding staff satisfaction with the bleep system and their suggestions for improvement. 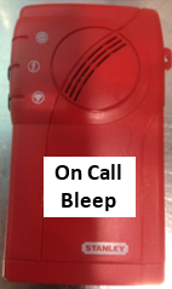 Bleeps were frequently directed to the incorrect team/team member during the daytime (40.3%, between 2-5 times per SHO per shift), this did not happen at night (0% of bleeps). In addition, a proportion of bleeps were found to be repeated (10.3%) or unnecessary (10.3%) due to information already being available in patient records. The evaluation of patient notes showed that a significant number of entries did not include clinicians’ contact details. This varied considerably by specialty, ranging from 27 to 100% of entries lacking appropriate contact information. to introduce interventions to improve the system, re-assessing their effect through repeated PDSA cycles. The proposed changes were discussed in handovers to gain medical and nursing team’s views on the new system, and adjustments made to the process accordingly. 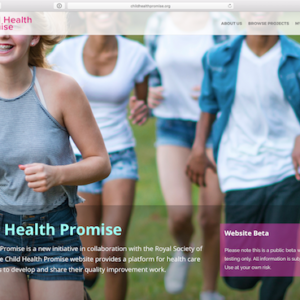 A date was set to implement the new system, and information relayed to medical staff via email, along with a verbal reminder during ‘huddle’ handovers in the doctor’s office. The matron and nurse-in-charge were also consulted for their views, and were informed of the planned changes too. Following initiation of the whiteboard intervention, snapshot data was obtained. This demonstrated that only 66% of boards had the correct number documented, and that one bay was lacking a whiteboard nearby. A lack of pens was also noted to be limiting the use of whiteboards. A new whiteboard was placed in a bay that lacked a nearby whiteboard, and new pens were obtained for all whiteboards. To ensure that this intervention was sustainable, a request was placed for whiteboard pens to be re-ordered along with other ward stationary. Additionally the pens were attached to magnets by string to avoid their use in other bays/areas and the bay number was attached at first to the pen and then to the lid to promote sustainability. These changes resulted in some improvement in uptake of the intervention, 100% of bays had whiteboard and pen with 85% of boards having correct General Paediatric bleep number documented. Following the implementation of the new bleep allocation system, it appeared that bleeps were not being received to one bleep when dialed from a ‘rogue’ telephone in the bay allocated to that bleep. This had caused some frustration amongst the nursing staff, who thought their bleeps were being ignored and that the new system wasn’t working. To resolve this issue, the bleep allocations were changed so that the ‘rogue’ telephone was linked to a different bleep. Information about the new system was also printed on the nurses’ handover sheet to better disseminate information to nursing and support staff. Feedback from the nursing staff regarding the updated bleep allocation system was subsequently generally positive, although some commented that it was taking some time for all staff to gain familiarity with the new arrangements. Feedback from the general paediatric SHOs was encouraging, with significantly fewer concerns that one bleep holder was being overwhelmed by bleeps from the whole ward. However, an unintended consequence was that bleeps that were only ‘live’ in-hours were being called out-of-hours. This lack of clarity as to when certain bleeps were active resulted in bleeps being mis-directed out of hours and posed a possible risk to patient safety. An A4 sheet was created with easy-to-use contact information for bleep holders across all specialties, incorporating details of which bleeps were ‘live’ at different times. 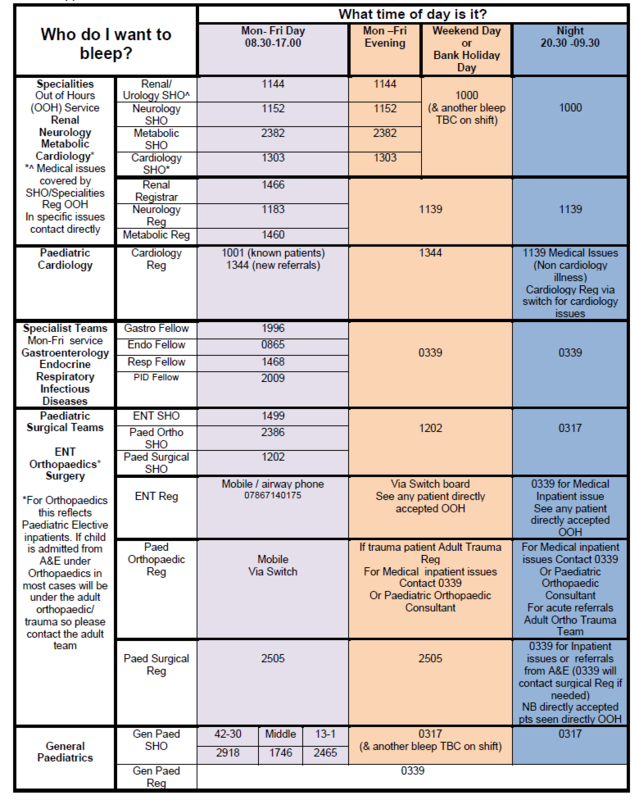 This poster was circulated included in the junior doctors’ handover pack and plans were made to distribute to nursing staff as well (figure 2). Several limitations were identified with respect to the collection of baseline data in this project. Firstly, there was potential for missed documentation of bleeps (e.g. during a busy shift), and a degree of subjectivity was implicit in the assessment of a bleep’s ‘appropriateness’ by the receiving doctor. Several comments were made about the length or amount of information needed to be completed on the bleep collection form and often if people were busy they struggled to complete the form. Furthermore, as only a small percentage of the total workforce of the ward completed the online survey; therefore results may have reflected respondents who held particularly strong views about the bleep system at either extremity. There was potential for bias in results due to the relatively small sample size of shifts where bleep data was recorded post interventions (e.g. due to day-to-day variation in total bleeps received) and also completion of the data collection form itself. Equally an aim of documentation of bleep number in the notes didn’t have a particular PDSA action point assigned to it beyond a reminder to improve bleep documentation amongst the medical team. Further initiatives could have included: posters as reminders for people to enter their bleeps in the notes or an incentives approach. Importance of setting out aims and objectives to ensure they are SMART can’t be emphasized enough at the beginning of the project. In the planning stage sometimes it is necessary to use surrogate markers of outcomes of what trying to measure. Success of a project depends on engagement by staff who are affected by the changes in the project and identification of key stakeholders is paramount. 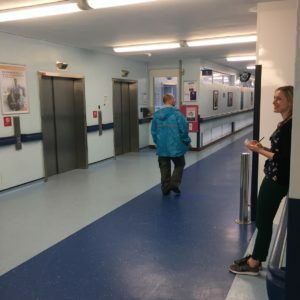 In this project this was achieved through liaising with ward matron, the nurse in charge and gathering the views of the ward itself through a survey and talking to people about their views. Equally having a willing core team involved in the project is good to keep the momentum. Some PDSA cycles may produce unexpected consequences e.g. bleeps still being considered ‘live’ out of hours and this means further actions need to be created that weren’t initially anticipated there is a need to be responsive to interventions. Sometimes it can be easy to ‘suggest an idea’ to solve the problem but by analyzing the problem in a PDSA way it demonstrates that the seduction of the solution should be avoided. For example a suggestion was ‘more phones in the Doctors’ office’ would help the situation; however, provision of an extra phone still wouldn’t help the person making the phone call know who to bleep. 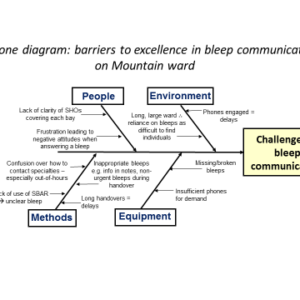 Bleep communication affects all members of staff on the ward, and therefore interventions to improve the system have significant potential to improve patient care and staff morale. Improving bleep culture is a multi-modal initiative and requires input from the ward as a whole to enable change to be achieved. Perceptions and attitudes of hospital staff toward paging system and the use of mobile phones. 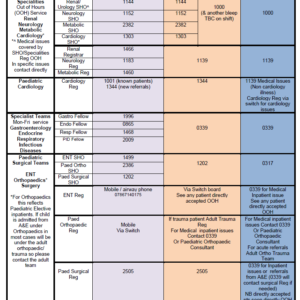 Haroon M1, Yasin F, Eckel R, Walker F. Int J Technol Assess Health Care.2010 Oct;26(4):377-81. Mobile revolution: a requiem for bleeps? Martin G, Janardhanan P, Withers T, et al Postgraduate Medical Journal 2016;92:493-496.